We at Spitting Pig London upon taking the booking of each event ensure that our customers will be happy on the completion of the function putting a pen to paper and writing a few words about the service they have received for their event. This ensures that we can monitor our selves and maintain the high standards of service which we provide each and every week to each and every customer both large and small. We then publish this information at the end of the year so future customers are able to view how other people have perceived our standard of service. This was an amazing experience, great staff, great atmosphere and above all great food! Will definitely be using them again, big thumbs up! It was absolutely fabulous. Russ did a superb job and everyone complimented the quality of the food. Thank you so much. Thank you very much for a fantastic hog-roast. The whole operation was very smooth and the pig was delicious. Paul was very professional and friendly and contributed to the relaxed atmosphere. We look forward to the next occasion. Thank you for making my wedding a very unique and special one, the Hog Roast was cooked to perfection and my family and friends agree too! The event was great , Stuart was brilliant guy. It was great thank you, and we appreciated your help with the various dietary requirements! It is a pleasure to give feedback- My chef arrived promptly and set up. Very nice guy. We spent time chatting with my chef and all our guests said how lovely he was. The food was absolutely delicious and have had so many texts from our guests complimenting the pork. I just wanted to say a massive massive thank you for catering our party last night. The pork was gorgeous, but the guys were fantastic, so helpful and lovely with our guests! We had a great party and have had so many messages already about the food and service. Thank you so much, we were extremely happy with every aspect of the catering on Sunday and have had lots of very positive feedback from our guests, thank you very much! Food was delicious and service very efficient and friendly too. Our event last week was brilliant, thank you. The chef (apologies, I forgot the name) was really good and fast. Absolutely delicious and we look forward to booking Spitting Pig again next year! Thank you for a great hog roast the food was amazing and the staff were polite friendly and professional top marks! Hi, London you were absolutely amazing! Thank you so much for being so attentive and friendly. The food was absolutely delicious and your service was impeccable. Thanks so much for organizing. Staff were lovely and food was fantastic! Hope you are well and having a brilliant week so far. The event was a great success and we were absolutely delighted with The Spitting Pig Co.! The guys were super friendly and professional and set up without a fuss. Service ran really smoothly and the feedback that we received from all of our guests was whole heartedly positive. The food was delicious and the guys couldn’t have been more helpful. We definitely plan to hire The Spitting Pig Co. for future events. I cannot thank Spitting Pig enough for great food, great staff, the team were so helpful. I had loads great comments about the food after the party with the added bonus they cleared up and couldn’t help enough. I would definitely recommend and use your services again. We were really pleased with the whole service from set up, helpfulness of the guys and the way the vegan option was dealt with. Everyone seemed to really enjoy the food and I don’t have any negative feedback at all. All in all we were very happy with the service and would definitely recommend you to others. Just a quick note to thank you for lasts weeks’ event. It was certainly very well received and I’m personally pleased with the friendly and honest service provided by Sam and Mr Thorne, also remotely by Vicky. We had a fantastic event. Paul and his team were excellent. Many people commented on how good the food was. It was great and we would definitely recommend Paul. Apologies for the delayed response, I’ve just been very very busy. We loved it, Katrina was great; very friendly, knowledgeable. Food was on time, tasted great, she stayed late, nothing was too much trouble. Very happy & look forward to having her back next year! We only have positive feedback for a wonderful meal. Everyone loved it. Thank you yes the party was a great success. Your team were very friendly and professional and absolutely no trouble at all to have on site. They even put up with two hungry hounds wanting to help and share! The quality of the food was great and we would recommend you to friends. We hired you for a party on the weekend and we were blown away by your services and food! We have found some leftover cutlery and are just wondering how to get it back to you? Sarah. Five stars, Paul was fantastic. So helpful, professional, on time and the food was phenomenal. Great variety of breads and try veg option was lovely. Great communication and follow through. We would definitely recommend and use your company again for any future spit roast events. He was absolutely brilliant… a very hard worker. Loss of guests wanted business cards. You’ve been an excellent company to deal with and I wish you every success in a continued successful business. And once again thank you very much for the guys politeness, hard work and help on clearing. Everything was perfect. Thanks for your help. I would like to thank you all for a splendid BBQ, the staff on site were fantastic and so was the food. We will definitely be using you again next year! The party was a great success and the hog roast was certainly a part of this! Everyone loved it and some have asked for your name so we have passed it on. It was brilliant. Katrina was great. Really good feedback regarding the hog roast. We will definitely have you back next year!!! The food was delicious and the service was excellent. Thank you very much for contributing to a wonderful celebration. Everyone enjoyed the food hugely Trina worked really hard on her own she presented, served and cleared up very well. I was planning on emailing you earlier in the week to thank you. The feedback was great, the crackling was perfect! And the day was generally well received by our staff and their families, as it was successful I hope it will become an annual event. We had a staff training day and thought this would make a change from the usual sandwich lunch! Staff absolutely loved it. The food was delicious and the guys were very friendly. I would definitely recommend you to others. We were very impressed with the wonderful hog roast at my 60th Birthday. Everyone made lovely comments about the food as well as the service provided by the staff. We will most certainly recommend you to all our friends and family. It was good to see the food prepared on site as well as the hog roasting. All the staff were very helpful and just got on in the background in a very unobtrusive way. Well done and thank you for making my party go so smoothly! The food was amazing on the night, the quality of the hog roast as well as the sides were really good. Service prompt and efficient (we had a tight timescale in our schedule to serve/feed everyone). There was also real abundance in quantities of food available. A huge thank to Steve and the team! The day was absolutely spectacular and the food, service and helpfulness of the staff was outstanding. All my guests comments were how wonderful it all was and would definitely use Spitting Pig Company for any hog roasts they would have. Many thanks to you all for making the day run so smoothly. The Spitting Pig team we excellent again! The feedback on the food was excellent and the team were very professional in everything they did. The bread selection was better than last year, which was good – the wraps were very popular. We will be looking to book again once we know the dates for next year. I am happy to give feedback, the wedding ( my daughters) was wonderful thank you. I was unsure we would actually need the hog roast on my daughter’s wedding day as had a three course meal around 4pm, my daughter was adamant though. However how wrong was I! the hog which was served from 8.30pm was an absolute hit. The service was fab, the food itself was mouth-watering and the pig stretched to over 160 covers, we had kebabs and sausage hot dogs too which all went and were greatly received by our guests who after a day of celebrating (& toasting) were really appreciative and very complimentary about the hog. Thanks to the team of two who were superb and managed throughout. A clean, professional no fuss winner all round. We had a party for my son’s 18th. We were so impressed with organisation, set up, service and the food…… so delicious and so much of it. Also the clear up was done efficiently, quickly and unobtrusively. Thanks very much, everyone loved it, we will be using you guys again. Fantastic service, great all round. Very impressed. Thank you it was a lovely evening with good food and very nice chef. The party on Friday night was wonderful. We had 200 guests who were all delighted with the pulled pork flour baps. The pork was delicious and succulent. Your staff were friendly, helpful and professional. A huge thank you to you and your team for an excellent hog roast on Saturday evening. Everyone thoroughly enjoyed the food which was expertly prepared, presented and, most importantly, tasted delicious. We were so impressed with the way that they arrived, set up, served, cleared up and left with minimal fuss and with a smile at all times. We will definitely use you again in the future and recommend your company to other people. We were absolutely delighted with the hog roast at our wedding. The food was amazing and all our guests commented on how nice it was and how much they had enjoyed it. The chef was brilliant and worked really hard to get everything set up and make sure people were served as quickly as possible. The owners of the venue also commented on how great he was. He was very polite, professional and respectful of the venue and its facilities. They asked us to pass on their comments. Overall we were delighted with the service and the roast itself and wouldn’t hesitate to recommend Spitting Pig Co to others. Hi, the chef who came for our wedding reception was lovely. He was very professional and friendly and chatted to the guests. The food was gorgeous. 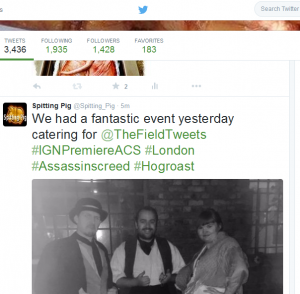 I’d highly recommend using spitting pig Surrey to anyone, for any event. Everything went really well, the team were great and the food was amazing. Excellent catering. Apologies just checked emails. I’d like to say the food was absolutely amazing. My guests loved the fact it was a wedding with a twist, all agreed the hog roast idea is brilliant. It brings a nice relaxed feel to the day. I will 100% recommend you guys to anyone I know for any kind of event, and the two staff you had for us, Paul and Adrian were outstanding aswell. Thank you and Paul so much for making the party go so well. Everyone loved the pork, stuffing and crackling and I suspect you will get some further business from that! Thank you also for helping us prepare beforehand and it was lovely to meet and chat with you both: you make a pretty good couple yourselves! We would like to thank you both again for the fantastic job that you did at our event. We were all incredibly impressed, not just with the food but by how self-sufficient you were. It made the whole event a lot easier for us as we didn’t have to worry about you guys at all. You were both highly professional, efficient and friendly and you contributed considerably to making our event a success. We would not think twice about using you again at future events. Thank you so much for catering my son’s christening. I have to say that the contact prior to the event was prompt and professional and the feedback we have received from guests has been excellent. In fact one of the guests has already asked for your contact details! I am told that the meat was amazing and as a vegetarian, the halloumi skewers were delicious. Will definitely use you again – thank you so much! In spite of the rain our garden party was a great success, and we received so much positive praise from our 100+ guests for the food. Our menu consisted of Hog Roast with all the trimmings, sausages, and halloumi skewers, and 3 beautiful salads to choose from. All our guests were catered for – kids, adults, gluten free, veggies – and everyone ate far too much! The desserts were to die for! Our choice of chocolate torte or strawberry and passion fruit meringue was perfect, again something for everyone, and again we all ate too much! Everything was delicious, well laid out and beautifully presented. The chefs were hard working and so courteous – a delight to have at our party. Thanks very much to all involved – not least the back office as our dates & requirements changed over the months and weeks running up to our event. Even adding on a large number of guests at the last minute was met with confident efficiency (and a generous adjustment in figures). There was nothing left wanting from our arrangements, and we would certainly recommend Spitting Pig Co. to others – and use again ourselves – for any event. It was brilliant thank you. Paul was lovely and so willing to accommodate our requests. It was professionally set up with out a formal air which suited our event perfectly. And most importantly the hog was delicious! The party was a great success. The food was really tasty with plenty left over, all the guests enjoyed it and Peter was amazingly helpful, he stayed on-site for longer than I expected making sure that the guests were fully fed sometimes second time around! Our Staff Day event on the 28th June went very well. Adrian and the team were fantastic and committed to ensuring the catering was top notch. We’ve had raving reviews about the quality of food with various teams asking for your company details. The overall appearance of the Spitting Pig setup was so professional that we even themed our event décor around the stylish black and white look of your company. Thanks again! I had quite a few comments on how friendly the service was, and brilliant with the small children. One of my friends is a pro musician and has worked at lots of events therefore consumed many many hog roasts, and he said that yours was one of the best he’d tasted. So thank you very much – one very happy customer. I can thoroughly recommend the Spitting Pig Co. to anyone who is looking for hassle free, high quality catering for their special event. I recently hired them for a surprise birthday party for my daughter, catering for around 100 people. The team is very proactive in that they are in regular contact ahead of the event, confirming menus, other dietary requirements, checking access to the venue etc. On the day, all I needed to do was provide a plug socket for our chef and he did everything else. The cooking utensils are spotless and the food tastes as good as it looks and is very nicely presented. Our chef worked seamlessly around our guests and we almost didn’t notice him packing up his equipment. Another big plus is that no rubbish is left as this is taken away too. All in all an top quality experience. Just to say a very big thank you to Paul for a fantastic job on Saturday. He was very friendly, polite and professional throughout the evening and it was a pleasure having him at our home. The food was fantastic and all of our guests commented on how good it was. I would definitely recommend you to all of our friends and if we ever organise another similar event we will not hesitate to contact you. I was really happy with their service. The two guys were super helpful and very polite. The hog roast tasted great and was very popular. Overall a great experience and I’d definitely recommend them! It was very good thanks even though the weather was a bit hit and miss. The food quality was second to none, the staff as always was helpful and friendly nothing was too much trouble, good selection offered and would highly recommend you. I received from our staff members as well as the MD only positive feedback. Thanks for Saturday the food was delicious . I didn’t get to say goodbye and thank you. The food was superb I have had so many positive comment and requests for your details for future events. Paul and Sarah arrived and set up the roaster and the gazebos, and apart from checking all was going to schedule, were invisible until a short time before serving. Absolutely the most professional, discreet caterers we have ever had. The food was outstanding and we received so many compliments and enquiries for their services. Pleased to highly recommend and waiting for an occasion to use them again. The Spitting Pig Team were fantastic. They went down really well at the event and I have no negative feedback at all. Everyone loved the Hog Roast! Thank you for running the Hog Roast at our party yesterday. It was a great party and everyone enjoyed the food. All aspects worked. The pork was excellent and all the salads, potatoes, rolls, vegetarian meals etc were all very good. It helped so much having you bring all the disposable plates, napkins and cutlery. No washing up needed. Overall feedback was excellent and Spitting Pig certainly met our expectations. Thank you too for all you did in setting up, serving and clearing away- it was all very well organised. Thank you for the email, the event on the 18th was very successful. Paul was very helpful and attentive to all guests and really enabled us to adjust around the clients timings and requirements. Thank you for your assistance in this event. Sorry for the delay. I have been away since our event and it’s taken me a while to catch up. Thank you very much for the service you provided to us. Everyone was very complimentary about the quality of the food and the service. Even the plates and cutlery were nice and sturdy! We would definitely use you again! Thank you very much for supporting our opening events. The staff were polite and engaging and the hog roast went down a treat!! They were punctual, worked very professionally and left the area spotless. The staff loved the left over hog roast that they took home and all the customers loved the rolls that we were serving. The event was a great success thanks and the food went down really well. Everyone I spoke to said how tasty it was. Your staff did a sterling job with the preparation and serving; you all worked extremely hard. All went very well thanks! Can’t fault your company at all and the two gents serving were well mannered and making conversation with customers which was nice to see. A big thankyou to Adrian & Paul they really did us proud at our garden party in Chiswick. Although we only had a small party Adrian made everyone feel special and cooked us half a hog so there was very little left over, just enough for a final round of sandwiches in the evening. 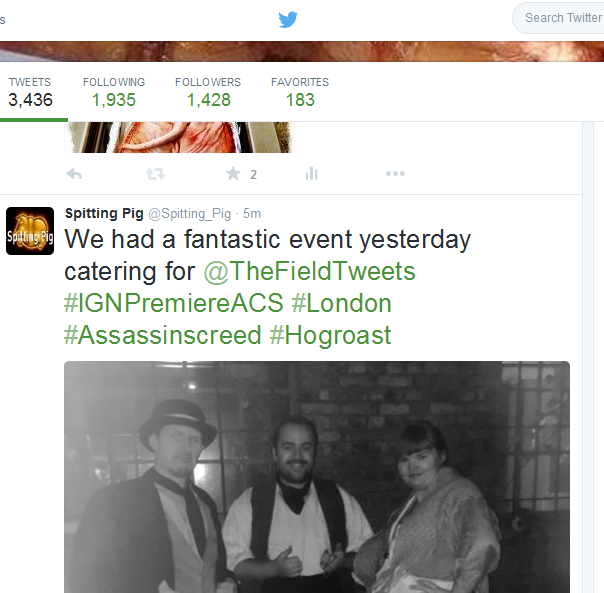 Would just like to thank Spitting Pig for such a spectacular event last week. I am sure it would not of been as much of a success if you had not come along. Thanks again and we will certainly be booking you in the future. I would just like to say a huge thank you to Barnaby and all at the Spitting Pig Catering Team for a fabulous Hog Roast at my son’s 18th Birthday bash on Good Friday 3rd April. All our guests commentated on how delicious the pork was and some have asked for details to look into booking you for future events. Just to say, thank you so much. It was fantastically received! A great big thankyou to George and the team and a cheery wave from little Bart. Thanks very much for our perfect Chigwell hog roast the crackling was the best ever tasted and will be long remembered. and left – curry tonight!! Didn’t even see him leave ! A big thank you and I will definitely recommend Spitting Pig in the future. The event went really well and the food side especially. We had numerous positive comments about how delicious the pork was and your guys were seamless with their setup and take down. Loads of pork left over which has been great but have had enough for the time being !! All in all we were very happy and we have already given your company name to a few of our guests. The event was a huge success – everyone very much enjoyed the turkey sandwiches! Steve was amazing with organising everything quite last minute, and Paul was great with sourcing, preparing and serving everything on the day. Everything ran very smoothly, considering how tight a schedule we provided to Spitting Pig. Have used you guys previously, and no doubt will do so again in future. All our guest loved the hog roast the chefs cooked and prepared for us and many was on about booking Spitting Pig for future events. Thank you so much for the hog roast at our wedding, the food was lovely and there was plenty left for people to have a second helping, it worked really well, we were very pleased with it. Thank you – the event went very well – the food was lovely and enjoyed by all. Please do pass on my thanks to the young men who organised things – they were very efficient and a pleasure to work with. Hello, Spitting Pig London. Paul and I are just writing to say a big thanks to Alex, Michael and the rest of the Spitting Pig London team who helped provide the catering for our wedding in Bethnal Green last Saturday. I was amazed at how quickly everything was prepared and how well the catering was organised. Your staff were an absolute delight to deal with they were so courteous and even when we needed to serve half an hour earlier it wasn’t any problem for the them. If lost count of the number of guests that commented on the food to say how fantastic it was, one of my closest friends even said she would like to book you for her next event. The spit roasted pig was the best I’ve ever tasted and it honestly made the day. I couldn’t of asked for a better service and just want to say a big thanks again especially to Jayne in the office. Greetings from Mr and Mrs Warmsley, we just thought we’d send you a quick email to say how beautiful the food was last Saturday at our wedding. The spit roasted lamb was a particular favourite of mine. We were so stressed leading up to the event with various other issues as I’m sure you now know but the way in which you organised the event from start to finish was just fantastic the catering was the one thing we knew we didn’t need to worry about. Also we’d like to give a big thanks to Sam the chef on the day we had a lot of trouble with the marquee and he took everything in his stride not only did it not affect the brilliant food he produced but he also found time to help us out in other areas we struggled with.We have sent over a little thank-you present for Sam and the team for their help we can’t thank-you enough. The whole family would like to offer a big thank you to everyone who helped us out with our bonfire celebrations. The machine we hired was easy to use and everyone enjoyed the tasty food that we cooked. It was perfect for all the adults and children and we will definitely be using you again next year. It went down a treat. Thanks again Adrian for your help with the preperation. Definitely the best food we have ever had at one of conferences. We organise business meetings on a regular basis for potential clients and always to struggle to pick which food to have. After trying your hog roasts we won’t be looking anywhere else now. Everything from the food to the chefs was first class and really impressed our new customers. Thank you so much for the machine hire in Brixton market for my stall. We’ve been running a food stall on our local market for years and we’ve been looking for a new way to reinvent our stall. Hiring one of your machines was the biggest stroke of genius we have ever had. Business is booming now people know about our new machine and it was so good that we will be in touch about purchasing our own machine from you. We organised a Halloween party for all the children in our street and used you for the spit roast at our party. The spit roast was perfect. Not only did it taste good but it was scary too. Everyone was so impressed with the way it looked and was the perfect centre piece for any spooky party. We used you about three weeks ago to cater for our Christmas party and just want to say that we will definitely be using you again next year. Every single employee enjoyed the food whether it was the meat or vegetarian option. We will definitely recommend you to everyone. James Dewhurst and Sons, Plumbers. Definitely the most professional catering company we have ever dealt with. Our monthly team meetings are now always catered for by Spitting Pig London and we are really impressed that your high standards are always maintained. Plus the food is absolutely delicious. We don’t have any complaints to make at all and will continue to use for the foreseeable future. We use you every year for our family Christmas dinner. Hiring one of your machines is becoming a bit of a family tradition in our house. The machine is perfect for cooking the most delicious Christmas dinner we have ever had and is so easy to use. We even use the hog roast machine to cook our vegetables. Everything gets cooked to perfect because of your machine. Can’t wait till next Christmas. I recently went to my local food market and there was a hog roast sandwich stall. I’ve never noticed it before so I thought I’d give it a try. The food was melt in the mouth good. The man who was running the stall said he got his machine from you guys so I couldn’t resist letting you let you know how much I enjoyed my hog roast sandwich. I’ll definitely be going back for more next week. We have just recently celebrated our 25th wedding anniversary and used you for the catering at our party. We would both like to say a massive thank you for everything. The professionalism of your staff leading up to and during the party was exceptional and the food was delicious to say the least. You definitely exceeded our expectations and we look forward to using you again for our next anniversary. Me and my mates are always looking for something good to eat after the football. We have had bbq’s and takeaways but can’t find the perfect food. One week we decided to go all out and tried hiring one of your machines. It was the best thing we have ever done. We enjoy cooking whatever meat we want and all enjoy having a go on your machines. It is the perfect after game food to enjoy with a nice cold beer. Just a quick thanks for providing the delicious food at my 21st birthday party. We served the hog roast buffet style and your chefs made sure the food was cooked to perfection and that everyone got fed and enjoyed the food. I have recently organised my daughters christening and we used spitting pig for the catering. We were looking for something different and hassle free and we weren’t disappointed. Your event planners were so helpful from start to finish and the chefs and waiters really helped to make our little girls day very special. Not to mention the delicious food. We couldn’t have asked for more. I have just graduated from university and was looking to host a graduation party for me and all my friends. I don’t have a clue how to cook so I was looking for something hassle free and tasty to impress everyone. You provided everything I needed for the perfect party; I couldn’t have gone any better. You cooked the food 10 times better than I could have done myself and it was such a relief that everything went so well. Just been to my works Christmas party and was actually blown away by the food for once. It was a hog roast served buffet style with all the trimmings and was absolutely amazing. My manager told me it was you guys who provided the catering. It was the best Christmas party I’ve been to because of the food and I can’t wait till next year. We used you for our New Years Eve party last year and just wanted to say the food went down a treat. We hired one of your spit roasting machines and were so impressed with the outcome. The food was cooked amazing and the way it looked was truly amazing. Nearly as good as the New Year fireworks. I was searching high and low for the perfect catering for my husband’s 50th birthday party. I was recommended Spitting Pig by a family so I gave you a call straight away. I couldn’t believe how good the service and food from you was and it was the perfect surprise for my husband and every single guest at the party. Me and my wife recently went to a restaurant in central London for our Sunday dinner. The restaurant was trialling one of your hog roast machines as an alternative to oven roasting their meat. We would just like to say it was absolutely delicious and prefer it to traditional forms of cooking. We hope more establishments follow the trend. Would like to say a big thanks for helping out at our MacMillan charity event. The stall we had serving hog roast sandwiches helped to raise a lot of money for our charity and your help is much appreciated. We hope to use you again in the near future. Thanks dudes, for making my 18th birthday so memorable. We had a spit roast machine that was the perfect centre piece for my party and it provided mouth watering food for everyone. There wasn’t one complaint from anyone and everyone went back for seconds. Plus the chefs and waiters were so friendly and made the night that extra bit special and relaxed for us younger items.